Seanan McGuire’s obsession with fairy tales comes through loud and clear in her work. She tends to use fairy tales as a springboard of sorts, but she always lands on a completely uncharted territory. Indexing might be the best example of this, but Every Heart a Doorway isn’t far behind. Eleanor West’s Home for Wayward Children is a place for those who have, at some point, stumbled upon a doorway to some other world. Each of them carries the consequences of their stay and every one of Eleanor’s kids wants to return. In this school they find understanding and the patience needed to adapt. Eleanor herself has a doorway open and she’s been going back and forth for years. Like all Seanan’s books, Every Heart is gorgeous, flawlessly written and just plain weird. It’s actually a novella, but a fairly unusual one. It’s somehow both thrilling and calming, both simple and extremely complex, both light and full of strong messages. Seanan’s worldview comes through loud and clear and she relies on her trademark humor to keep it from being preachy. 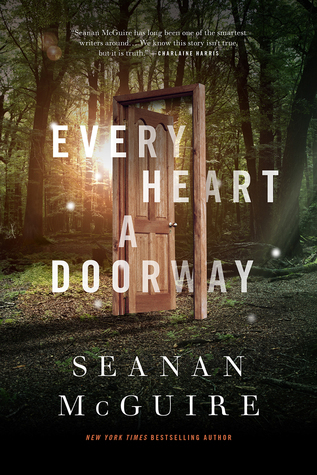 With an asexual protagonist, a transgender character and several strong passages on gender equality and equality in general, Every Heart a Doorway is a book you can enjoy and learn from, all at the same time. I am in love with the richness of this novella, the creepy atmosphere and the wonderfully diverse characters. It’s a story that might have been told a million times, and yet somehow it’s completely new and exciting. There are very few authors I trust as much as I trust Seanan McGuire, and this is why. Her wonderful imagination and her unique spirit guarantee a story I’m unlikely to ever forget. Well, I love the cover and sound of it. Maybe I'll have to check this author out. I've never heard of her. This is one of those authors whose work I've yet to discover for myself. She's got a cult following, this much I know is true. Is it just me or does this book sound a bit like Miss Peregrine's? I've loved all the books by her that I've read, if they've only been the ones under the Mira Grant pen name. I must give this one a try because it sounds super intriguing and that quote totally won me!! I loved this one Maja, although I listened on audio. I think I want to read everything she writes and I've only read one. Oh yea, this one is totally on my wishlist with the rest. She has become my "I must read" author. Utterly superb review. I have this on my TBR, because I'm pretty much guaranteed to read anything Seanan writes. It sounds so wonderfully imaginative, and progressive to boot. This author is new to me but I love the sound of this book.